I'm fully aware that raw beef isn't everyone's idea of a nice, or proper for that matter, dish but for me it comes close to perfection. I don't limit myself to beef based Tartare, I've also enjoyed seafood based Tartare's on occasion. Tartare have also been the cause for embarrassment at one occasion. We went for dinner at some place on Kings Road in Chelsea and they were nice enough to have Tartare on the menu. Which I swiftly ordered when the waiter took our order. What I had not expected was that they would actually mix it up at the table. Some bloke turned up with the meat and the various ingredients at our table. He then proceeded to ask what of the ingredients I'd like and in roughly what proportions. He then proceeded to mix it up and finally I could dig in. It felt like the entire restaurant was staring at me during the preparation - I was definitely not expecting it to be assembled at my table. I am such a fan of Tartare that even to this day I won't let the memory of this episode stop me from ordering it if it is on the menu. I just hope it will come pre-assembled to the table and not made into some form of impromptu performance art in front of everyone. Enough about my embarrassments - below you'll find the ingredients I like and how I think it should be made. Before that though, some pointers and thoughts around this. I have not specified the quantities of the ingredients, follow the flow and make it the way you feel is right. If it turns out less than good, adjust and try again. The amount of beef does of course depend on whether or not you are planning to serve it as a starter or main dish - or as a midnight snack if you're that way inclined. Somewhere between 100 - 200 grams per person is a good starting point though. Quality. 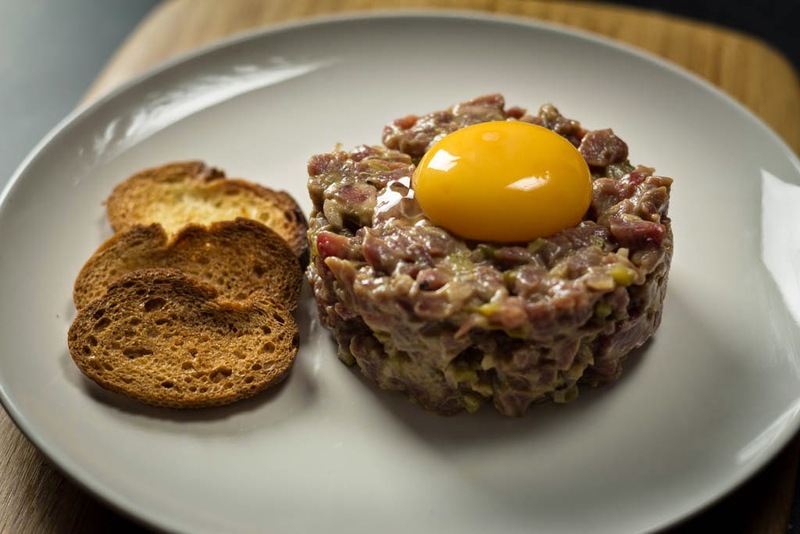 You cannot make good Tartare without good quality beef. End of. As you can see below, I have not specified what cut of beef to use either. Use your best judgement and adjust to what your tastebuds are like. Fillet works, but so does sirloin and rump if you're that way inclined. I would probably stay clear of 'diced stewing steak', minute steaks and other such cuts. I find that if you pop the beef into the freezer for about 30 - 45 minutes it becomes easier to slice. What you want to accomplish is for the surface to freeze - do not freeze all of it into a lump of ice. I like to slice the beef, then baton it and finally dice it. Some people do it differently, I've even heard of people who wield two chef knives, one in each hand, to get the deed done. That I'll leave to the Japanese super samurai chefs - I don't have the dexterity or abundance of digits to dare that. The thing I'd strongly advice against is to use a mincer to get it done. Experiment until you find the way that get you the consistency and size you like. I've had Tartare where it has been quite 'dry' and mixed together quite hard and moulded to resemble a steak. I've had Tartare that has been extremely 'wet' and just in a big slop on the plate. There have been occasions where the ingredients have been dotted around the plate and I had to assemble it myself. My favourite, right now at least, is a wet, but not sloppy, mixture that is plated using a cooking ring. For you - freestyle it to make it the way you want it. In a bowl, first mix together one egg yolk, mustard, capers, shallot, cornichons. Stir in the chopped beef and season to taste with the tabasco (or other hot sauce of your liking), Worcestershire sauce, salt, pepper and lemon juice. Arrange the mixture on a plate using a cook ring, if you so wish, and balance the remaining egg yolk on top. Haha I guess not! It looks nice, but I'm not really a raw meat kinda guy so I'd have to throw in on the BBQ first. It would be like a deliciously posh burger! It would be too wet, at least with the proportions of egg and liquids I use, to go on the BBQ. It wouldn't hold together well at all. Starting with a good piece of steak and mincing or chopping it to make your own burgers is an ace idea though. Mike, I don't eat raw meat or eggs, but if I did I would try this recipe. I like all those ingredients and think they'd make a great combination. The flavours are good and works really nice with steaks, I've played with these in marinades and sauces when I barbecue or fry meat so maybe that could be something for you?